This top, or ‘sweatshirt blouse‘ as it’s called is the reason I went into the store initially. I had seen it before but was waiting for a sale as I typically do. 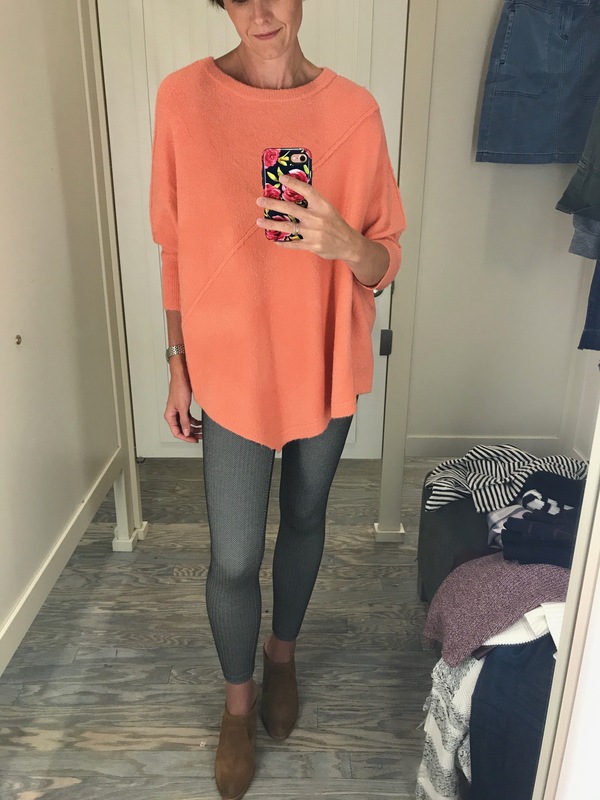 It’s adorable and comfortable and will fit into my day to day wardrobe perfectly! 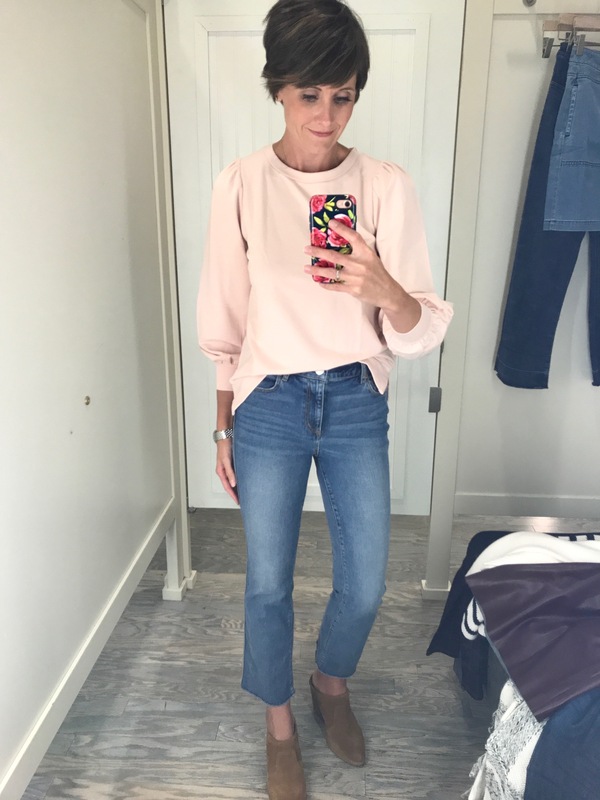 I’m also very much into straight jeans lately and love the look of this pair. I had the ‘back gap’ (is that a thing?) as I often do in their pants, which is a bummer because I loved everything else about them. 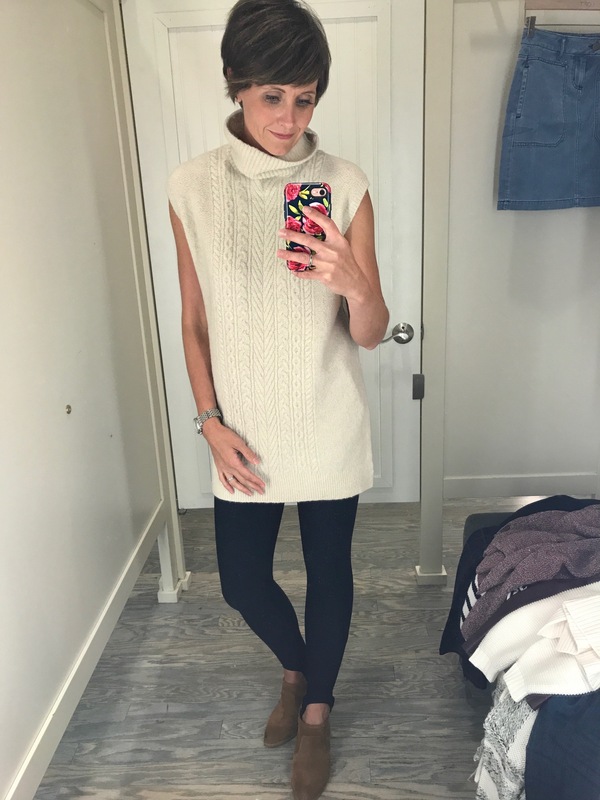 This sleeveless sweater is so cozy! It also comes in grey and oatmeal, all great fall options! This outfit doesn’t really scream Marisa, but I think it’s super cute. 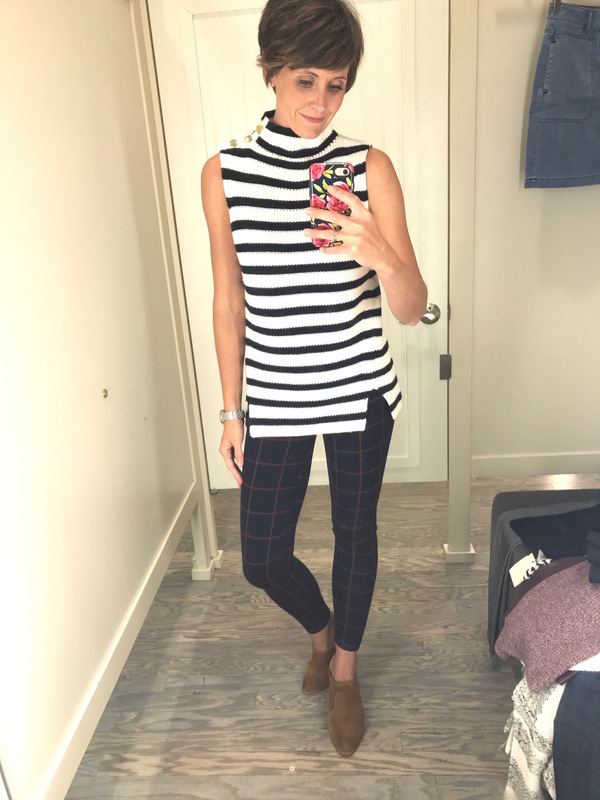 The plaid leggings are fantastic and I love it paired with the stripes of the sleeveless sweater. 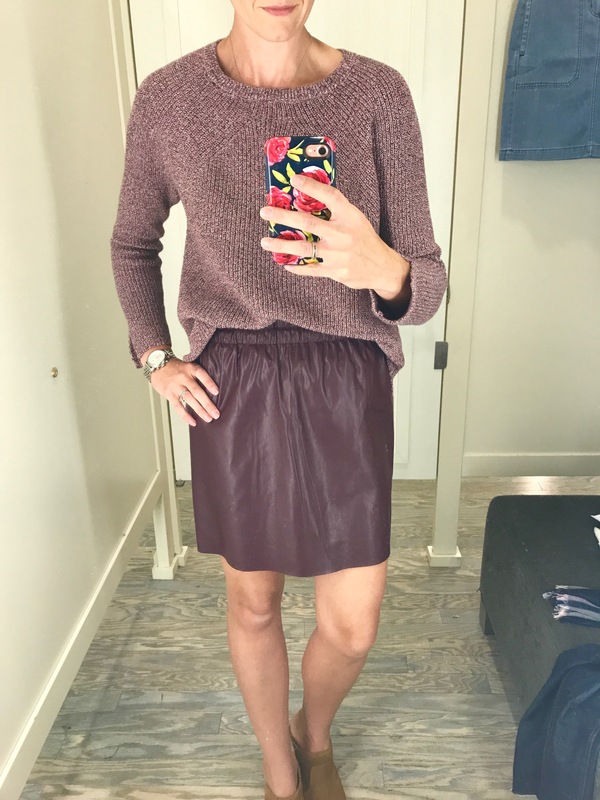 …and then I threw on this skirt with it and wanted to walk right out of the store wearing it! I couldn’t get the camera to capture the colors in the fitting room, but they are so rich and beautiful in person. 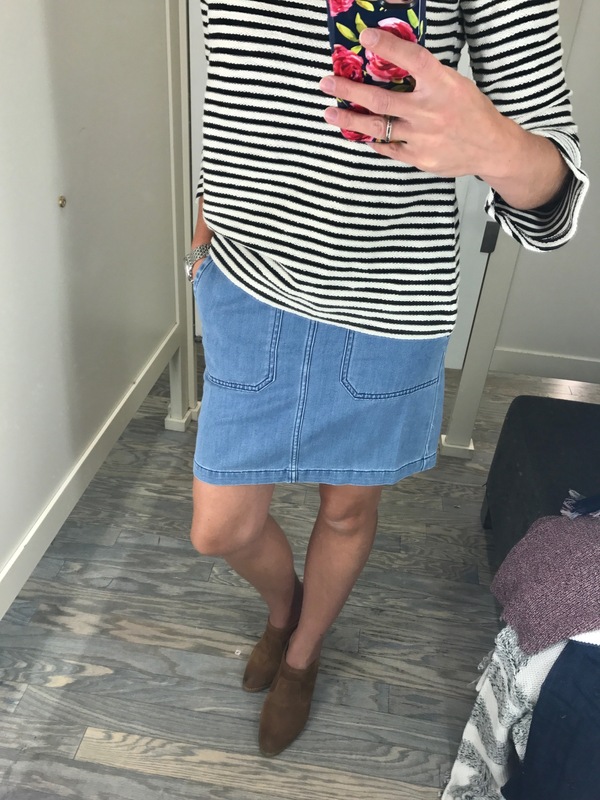 One more adorable skirt, and again, sooo comfortable! 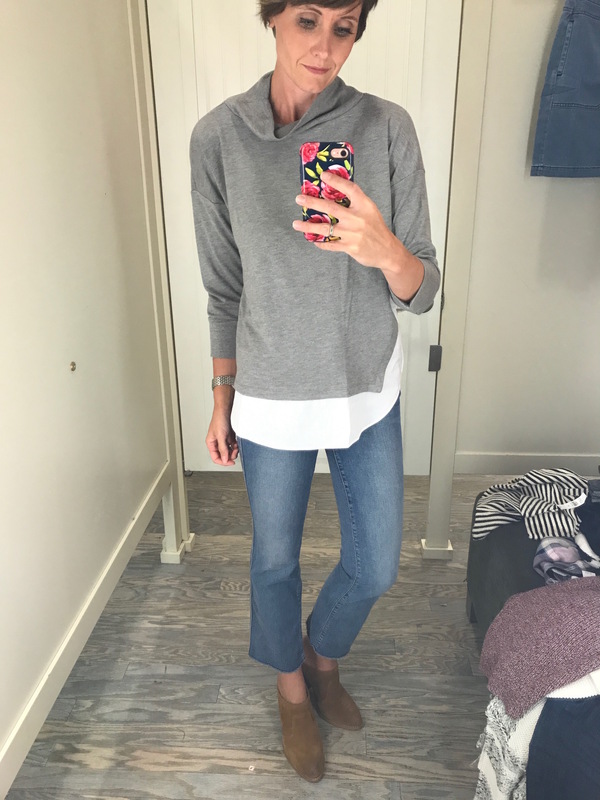 It has a nice stretch to it and is made with a super soft denim. 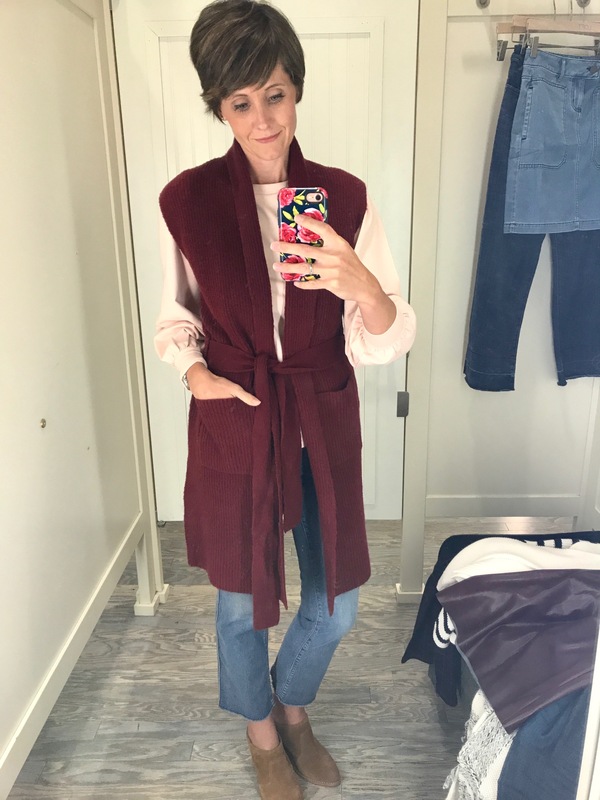 Great for fall (and spring and summer!). 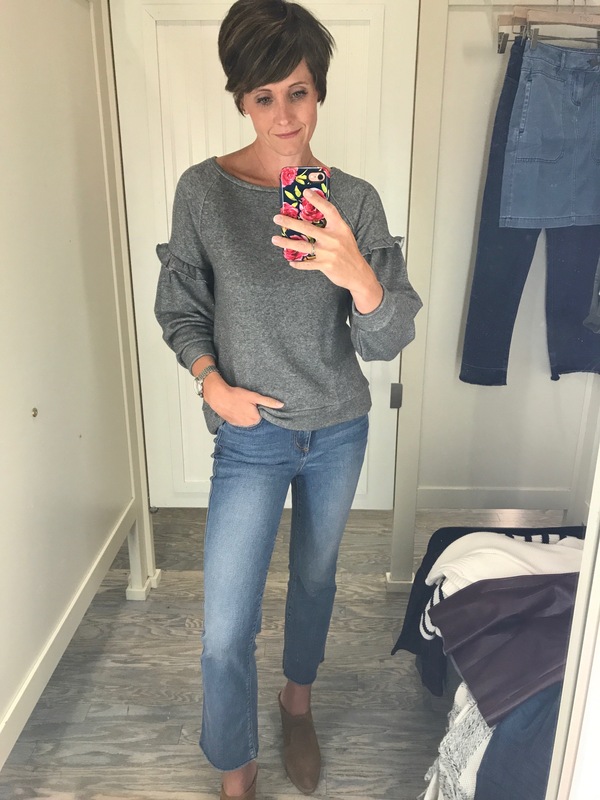 Adorable sweatshirt-like top that could easily be dressed up or down. I’d wear it at home with sweats, throw it on with denim or even cute trousers! 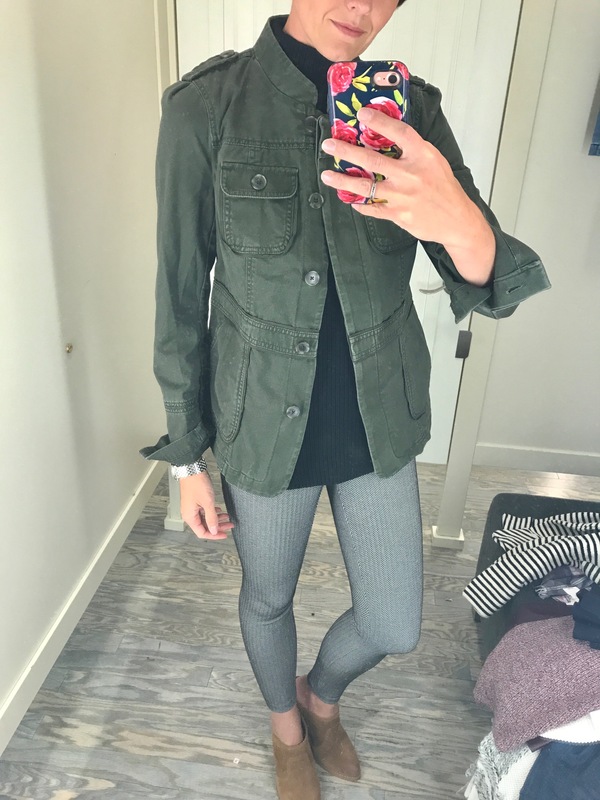 LOFT always has a cute military jacket on hand. This one doesn’t disappoint. 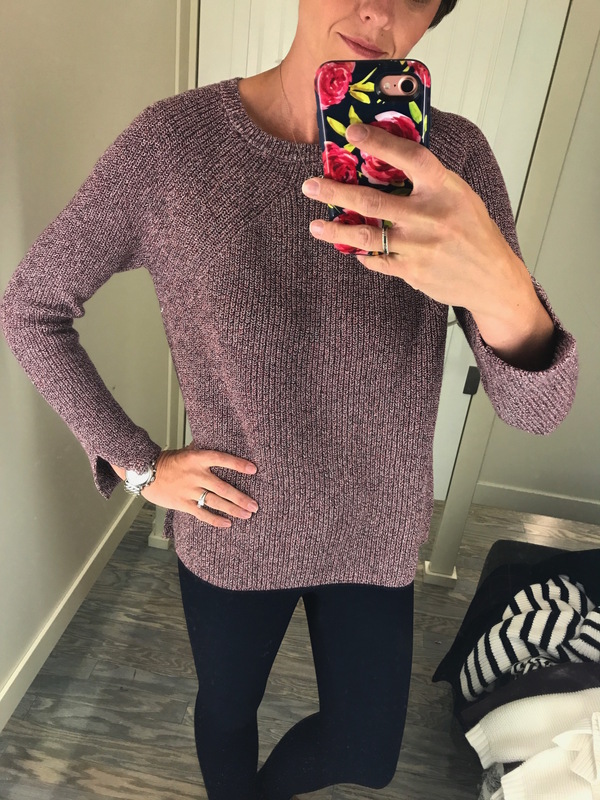 I’m going to finish off this post with some really great sweater options. This one is so flattering and the sleeves are adorable. It also comes in a few other colors! 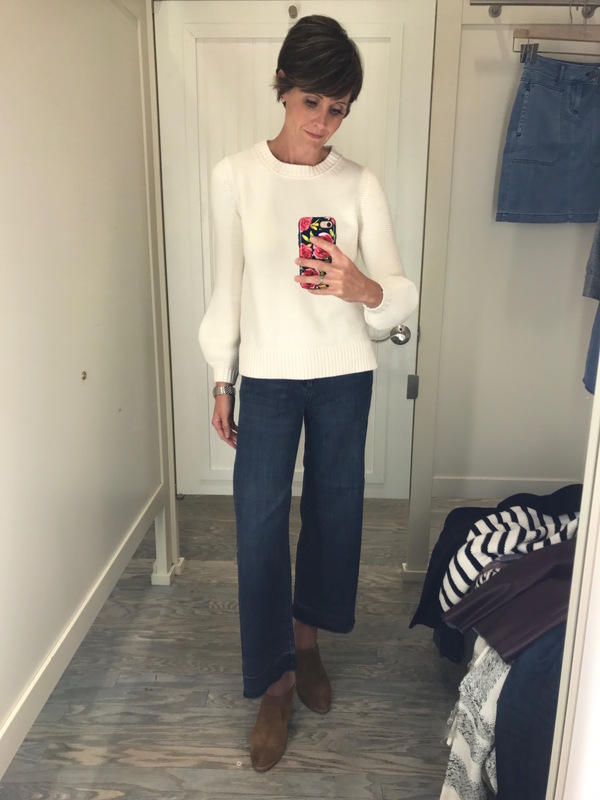 I also loved these wide-legged jeans. I needed one size down (which they didn’t have), but you can get a pretty good idea of the look here. 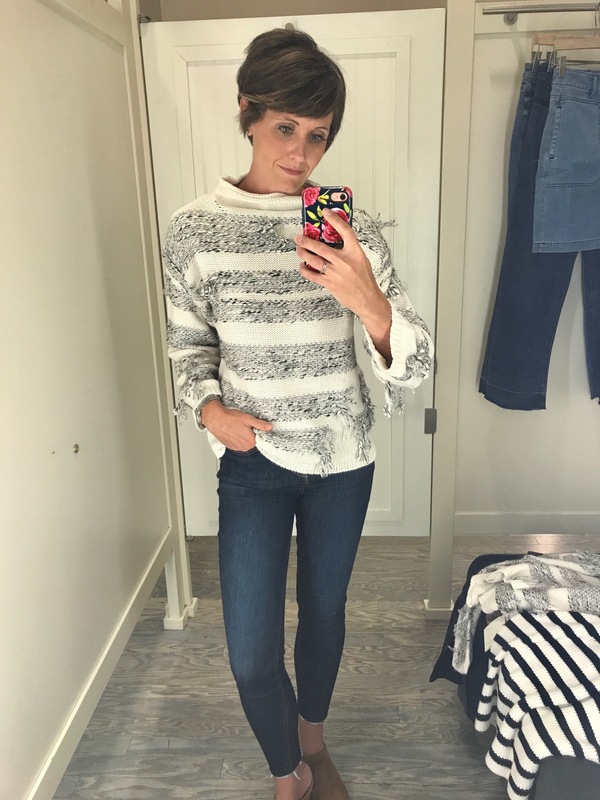 This Lou & Grey sweater was one of the first things I picked up. I love the shape and the fringe. 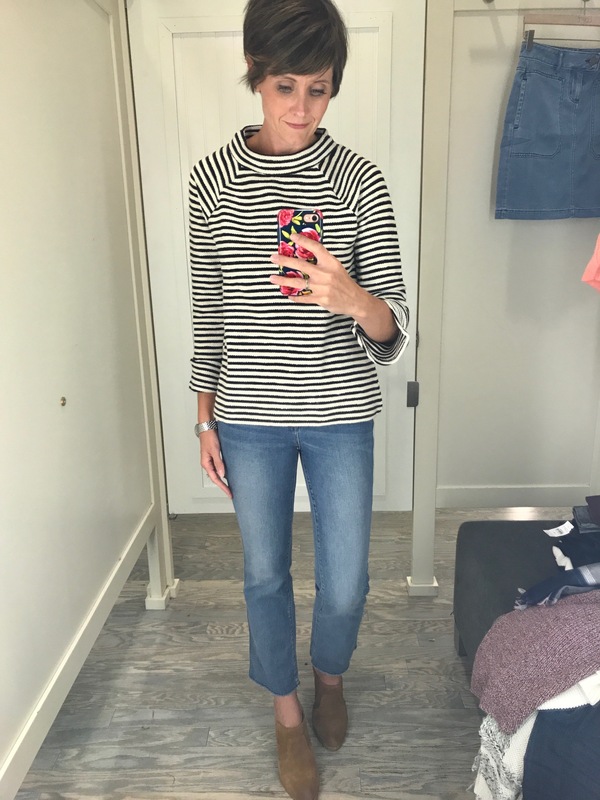 I’m wearing an XS here but probably would have sized up to a S if I bought it to get a slightly looser fit.